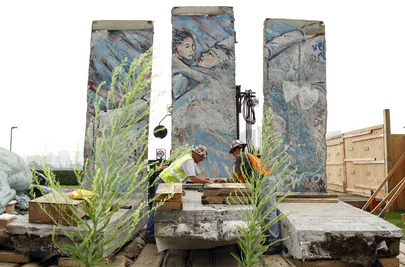 A new Berlin Wall through Kiev? "Sphere of Influence" and the Soviet Union by another name -- is that the objective of Vladimir Putin in reestablishing Russia's dominance over Ukraine but also several other former communist states two+ decades after the collapse of the Iron Curtain? An integrating Europe has been instrumental in dampening the prospects for conflict over the post WWII period between old adversaries, (most notably but not just France and Germany.) NATO has also been a catalyst for European unification even as some in old Europe (western Europe) had hesitated to incorporate states such as Poland, Lithuania, and Croatia into the relative economic prosperity and political stability of the European Union. The confrontation in Kiev is the focus. Less discussed, Putin's Kremlin has sought to block closer economic and political ties between the EU and several other states that it dominated during the Soviet Union. Armenia, Azerbaijan, Belarus. Georgia, Moldova as well as Ukraine are part of the envisioned EU's "Eastern Partnership" initiative. The Kremlin perhaps sees this as a threat to its Soviet Union established "sphere of influence." However, this new round of establishing dominance in the post Berlin Wall Europe is not limited to the former states of the Soviet Union. While Moscow has not directly blocked EU aspirations for Serbia, Montenegro, as well as Republika Srpska, it has actively sought to deter NATO membership for these Orthodox Christian majority states/regions. (Bulgaria and Romania are two Orthodox Christian majority states that have already joined NATO post Iron Curtain collapse.) Insidious rhetoric directed at the Muslim population of the region as well as presumed grievances with respect to the broader Euro-Atlantic family have been exploited. Putin's Moscow has rapidly extended greater economic and political influence than existed during the then-Tito ruled Communist Yugoslavia. Beyond rapidly interwoven business ventures, many foresee the Kremlin's efforts to establish an unprecedented military/naval presence along the Adriatic and Mediterranean. Russia has never had an actual presence, either during Imperial or Soviet period in the region. Continuing to be susceptible to the appeal of ultra-nationalist politics, many within Serbia's political and military leadership have put into question their European future while emboldening nationalist aspirations still more than smoldering from the time of Slobodan Milosevic. The embers are even more evident among the leadership of Republika Srpska, (an ethnically cleansed and now Serb-dominated region within BiH.) Unfortunately, EU-NATO efforts have been more to appease rather than counter such ultra-nationalist leaderships. Undoubtedly the economic upheaval experienced within the EU family over the last few years have distracted from the longer-term vision when a more ambitious inclusion effort may have been more effective than stoking the winds of nationalism within and along the periphery. The Soviet Union has Lost, Russia Can Still Win! Europe Without Borders or Walls? The age for a new Europe without both the physical and psychological borders is still emerging. The divisions and imperial appetites that had sown centuries of wars in Europe were also the roots of conflicts and exploitation on other continents. (These proxy conflicts still continue -- see Syria and Africa). It is in the interest of Europe but also the global community to retire the old definitions of belonging as "spheres of influence." The new world order cannot be a regurgitation of the old. A bottom up approach is the future and one accountable to citizens rather than rulers seeking to perpetuate an absolute hold on political and economic power.